Specifically designed for land surveyor firms working on the field, our software simplifies the surveys by using the field book Geocode directly. Our software is compatible with most total station data (LEICA, TRIMBLE, SOKKIA, TOPCON, GÉODIMÈTRE) as well as with the GNSS receiver. "Pcodes" is provided for direct compatibility with land surveying method. Mensura Genius calculates 2D or 3D traverses by proposing several compensation methods (proportional to the distance, least squares). The software also calculates K factor for distances. For more productivity, our software considerably simplifies your land survey. We propose an alpha-numeric codification, which is simple, intuitive and can be adapted to all notebooks. You can also set several coding tables depending on the type of the survey or the type of the client. The coding table is linked directly with the graphic database and its various categories (layers, linetypes, Pcodes, hatchings text styles), which enables you to easily complete your plans. 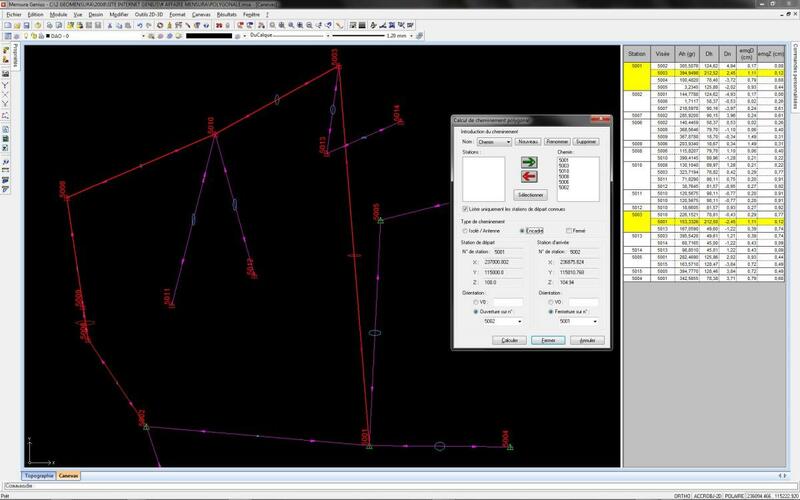 Our software offers a number of advanced functions which ensure the dynamic orientation of the Pcodes on one or several points. You can also associate several objects with the survey points. Mensura Genius proposes commands for parcel division. You have got a toolbox at your disposal to cut the parcels of the housing project starting from an initial polygon. The hatching and the dimensioning is automatic, any modification made to the outline leads to update of the parcel. An assistant defines the information attributed to the parcel (lot number, owner, surface). The land surveyor can manually modify its parcels. Mensura Genius automatically generated the parcel printing list. You can export results in Excel format.